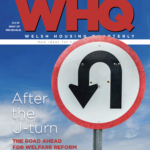 Welfare reform tops the agenda in the Winter issue of WHQ. Here’s a quick preview. In the wake of Westminster government’s u-turn on applying a local housing allowance (LHA) cap to social and supported housing, it’s back to grim reality as tenants, social landlords and local authorities cope with the continued roll-out of universal credit and a series of other benefit cuts. We report from around Wales on the impact of full service universal credit, looking in particular at what’s happening in Flintshire, Torfaen and Newport from Jen Griffiths, Ian Simpson, Claire Pearce-Crawford and Ceri Doyle. After the UK government’s concessions in the Autumn Budget there is some good news out there and landlords and councils are working hard to mitigate the impacts but the new benefit is leaving rising rent arrears and food banks use in its wake. It’s not as though the government was not warned. As Ian Simpson points out, the lessons from the demonstration projects were clear four years ago. Meanwhile Jennifer Ellis reminds us that the u-turn is not the end of the story on LHA as problems continue in the private rented sector and for local authorities in their homelessness prevention work. Welfare reform is a major influence of two of our other major features too: Ian Simpson reveals the first results of an analysis of the issues facing providers of housing for people on low incomes in the Valleys; and Douglas Haig warns that benefit cuts are just one of the contradictory government policies on the private rented sector that will mean fewer homes for people in need. Elsewhere in this issue you’ll find articles on everything from planning law to tenant engagement and the new housing evidence centre to housing association deregulation plus full coverage of Welsh housing’s awards season and all our regular features. But finally, and most importantly, we take a moment to remember Carl Sargeant and pay tribute to the late cabinet secretary for communities and children and his contribution to housing in Wales. The print version of the Winter issue of WHQ will be with subscribers in the next few days. Some articles will be available free here. If you’d like to join our subscribers and secure your print copy plus full online access, you can find more details here.